In March 2019, the Durham Orange Quilters Guild (DOQ) celebrates their 40th anniversary with an Art Walk in Downtown Chapel Hill on March 8 and 9, followed by a Quilt Exhibit at Chapel Hill Public Library on March 16 and 17. The exhibits will feature more than 50 quilts, some made the same way as previous generations made them, and others that show how quilting as an art continues to evolve. Since the resurgence of quilting in the mid-1970s, new media and methods have developed. 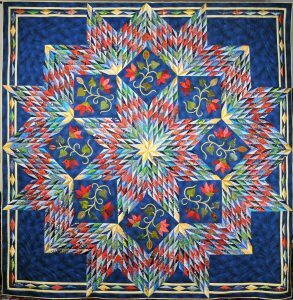 Vibrant colors and fabrics, as well as, non-traditional materials and designs, are being incorporated into the quilt making art. The Quilt Exhibit at Chapel Hill Public Library on March 16 and 17 will feature a display of more than 50 quilts, with a special section of red and white quilts to celebrate the guild’s Ruby anniversary. In addition, DOQ will lead hands-on demonstrations to teach the public about quilting. Learn more about the DOQ Guild here. - For three days only join us for a photo exhibition of the WWII era Flying Tigers and their Chinese counterparts. A collection of photographs profiling pilots from both countries will be on display at Chapel Hill Public Library over Memorial Day weekend, starting with a public reception at 10:00 am Saturday, May 26 in Meeting Room B. Before the United States entered World War II, American pilots from the Army Air Corps, Navy, and Marine Corps volunteered for and became official members of the Chinese Air Force. 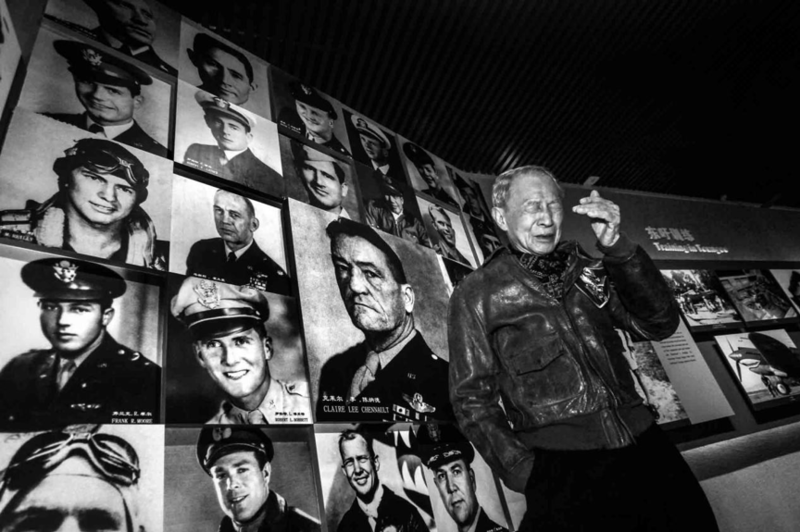 Called “The Flying Tigers,” these pilots protected mainland China from the Japanese Air Force, trained their Chinese counterparts, and formed bonds that lasted for more than 70 years. The exhibition is the work of Henk Liu, a Visiting Professor and research collaborator in the UNC School of Media and Journalism. He started interviewing the surviving pilots in 2005 to document the varied lives they lived post-war. 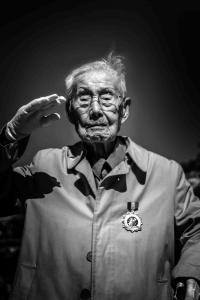 In addition to the Flying Tigers, Liu interviewed Chinese veterans, including the 104-year-old General of the Northeastern Chinese army. “I hope this exhibition can help the outside world better understand China's history in World War II, especially the period when pilots from China and the US fought side by side. I hope these pictures will make you feel the dignity of those veterans.” There are 32 select photographs in the series. They feature a range of people, from a celebrated Major General to a pilot who spent most of his life impoverished following an arrest during the Cultural Revolution. Susan Brown, Chapel Hill Public Library Director and Executive Director of Community Arts & Culture, says this show presents local residents with a chance to learn about a lesser known piece of history, “Professor Liu presented us with a great opportunity to both commemorate veterans on this Memorial Day holiday, and make connections to our neighbors with a shared, yet new, history.” The Flying Tigers Exhibit will be at the library from Saturday, May 26 – Monday, May 28. Due to the Memorial Day Holiday, the library will only be open from 1:00 – 5:00 pm on the 28th. Bilingual volunteer docents are available to engage with visitors and talk about the exhibit and the Flying Tigers. - RedBall Project is a traveling public art work by Asheville-based artist Kurt Perschke. 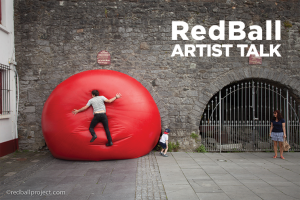 Considered “the world’s longest-running street art work,” the piece features a 250-pound, 15-foot-diameter inflatable red ball that is installed in both unlikely and familiar sites within a city. A blend of architectural intervention and community engagement, the piece has been to over 25 cities around the world, including Abu Dhabi, Taipei, Perth, London, Barcelona, St. Louis, Portland, Sydney, Scottsdale, Chicago, and Toronto. As its gift to town and campus in celebration of its sixtieth anniversary, the Ackland Art Museum is bringing this internationally renowned sculptural installation to Chapel Hill for a week-long performance beginning 20 September 2018. Over seven consecutive days, the giant ball will move through Chapel Hill, changing its location daily and playfully inviting all audiences to reconsider their everyday surroundings with a fresh perspective. The artist's only public talk will be at the library at 4:00.